I had a lunch with a new friend from church yesterday. We were sitting outside, enjoying the warm day and good conversation. I told him about some of my struggles and how they so interestingly had coincided with Lent and made me frankly consider Lent in a completely different way than I had ever before – and that I was thankful for that. He asked me how I was processing the theme of reconciliation that our church had be focusing on and I stammered a bit. Reconciliation, at it’s core, is broad, far-reaching, and hard to quantify. I mean, it really has to be. Even in the microcosm of our lives, the minutiae of the every day, reconciliation is not an easy concept to grasp or practice. As a church, we’ve been wrestling some with what it means from a community perspective, here in this area, here in this town, here in our every day world. I’m prone to personalizing everything and trying to figure out with whom I need to be reconciled, why, and how…and, honestly, it’s not something I find myself often desiring. Sometimes distance is easier than dealing. Our conversation focused more on the broader implications of this in our community and we both shared some of the issues and ideas on which we’d been ruminating. In the midst of this, we heard a yell and saw a kid dash by, chased by what I took to be a store manager or security person, with another one close on his heels. We watched, as everyone near by, as they ran and shouted at the kid, closing the gap on him. Not long after, two motorcycle officers flew up the street with lights and sirens on. I saw a broken kid, who made a bad choice for any of a myriad of reasons. I saw a kid who wasn’t just running because he was being chased. I told my friend about my trip to Romania and the impact it had on my life, my passion, and my purpose. I think I’ve held back on posting about it here in detail for so long because I feel like sharing it in this way, writing it out, might somehow bring it to a conclusion and that’s not at all what I want. I want what I saw to stay with me always, to remind me of all that I take for granted, to spur me into action in my corner of the world when it’s warranted – and, perhaps, even when it’s not. I’ll say this for now with a promise to revisit it all soon. 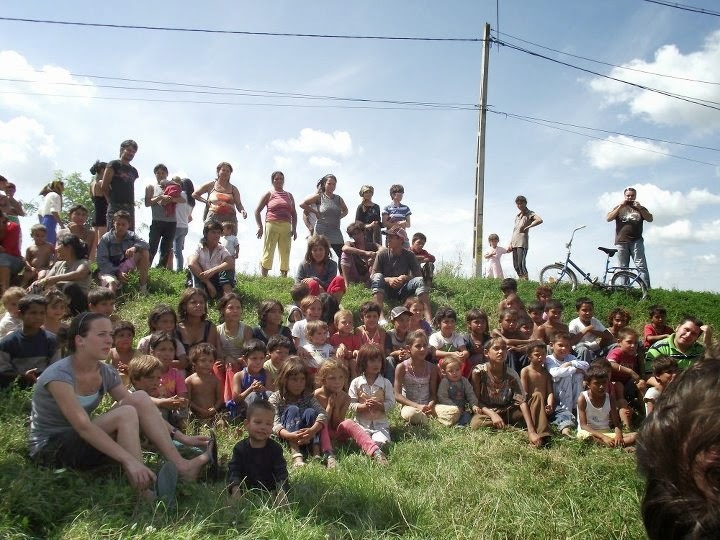 Part of the plan for our time in Romania was to visit an orphanage. In the weeks leading up to the trip, this was the thing that worried me the most. I was certain my heart would be shattered. I was certain I would start crying and never stop. What I wasn’t sure of was if I could even do it – to go and see what I was most afraid to see. But when all was said and done on the trip, it wasn’t the orphans who shattered my heart. It was the kids in the gypsy camps we visited, kids who had parents and other adults present in their lives, yet were unclothed, unfed, dirty, and completely and utterly uncared for. I left part of my heart with those kids and thinking about it now, a few years past, tears still well in my eyes. When I got home, I spent a lot of time telling people about the trip and how it went. I remember visiting friends of mine, one of whom was a former youth pastor and who was then working with the Salvation Army’s foster care unit. I told them the story, of my surprise, of my inability to let go and leave the images behind. It was then that he gently reminded me that this story plays out all over the world, not just in Romania, and it was playing out in my own backyard: children, broken by circumstances beyond their control, let down and hurt in unimaginable and unthinkable ways by those who were supposed to love and care for them. I knew this academically, of course; I’d been reading about troubled kids since I was a kid myself. I’d worked with and then supervised inner city kids for years at my very first paying job. I was a youth leader, for crying out loud. But that trip and that gentle reminder from a friend changed my perspective in ways I’m still learning. It’s what spurred me into becoming a CASA; it’s what drives me not to let go of my passion to work with teenagers, even when doors aren’t opening in the ways or timing I’d expected and hoped. And it never allows me to just dismiss any child, to write them off, to place a label on them and wash my hands of their memory. And I hope it never does.